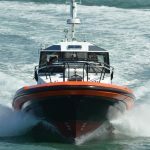 This craft is a further example of the ongoing relationship between Holyhead Marine and Camarc Ltd. The vessel is of a GRP construction and has been designed to be fitted with either waterjets or conventional propellers. 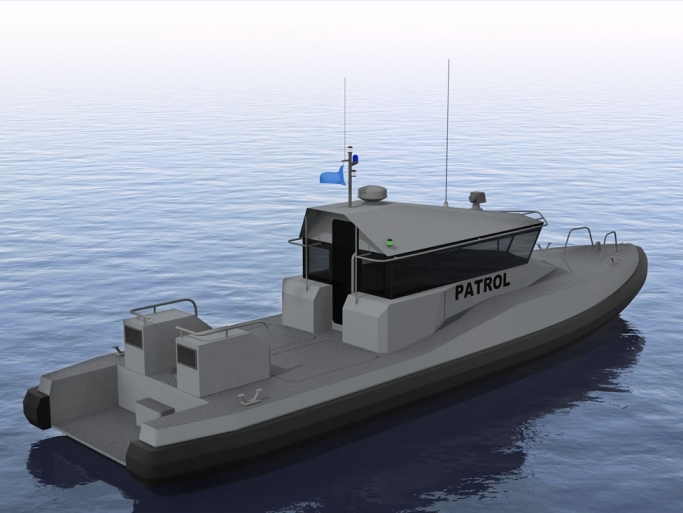 The design is part of a family of vessels which includes the very successful 15m Patrol Boat of which nine are currently in service with the UK Ministry of Defence Police. The philosophy employed in the design of the vessel has been one of using quality materials and components coupled with good access for maintenance to ensure a craft which is economical to maintain in the shortest possible time resulting in a high level of availability. The design has been developed with the maximum flexibility to allow the craft to be configured to specifically meet the clients requirements. This flexibility allows a variety of lethal and non-lethal weapon systems to be fitted coupled with varying levels of ballistic protection. Crew comfort has been placed as a priority with the design of this boat. The air conditioned wheel house features suspension seats for crew and a seating area for passengers with 360 degree uninterrupted view around the vessel. Full Load displacement 12 tonnes, dependent on specification. Gearbox Twin Disc or ZF to suit. Speed Propeller – 20-30 knots dependent on specification and engine options. 4 berths, upper and lower in fore cabin.